Knowledge of the history of Srivijaya in the early newborn of the 20th century AD, when George Coedes write essay titled Le Royaume de Crivijaya in 1918 AD Actually, five years before that, ie in 1913 AD, Kern has published Inscription City Limestone, a relic Srivijaya inscription found on the island of Bangka. However, at that time, Kern still thinks Sriwijaya name listed in the inscription as the name of a king, because Cri usually used as a designation or title of king. In 1896 AD, translated the works of Japanese scholars Takakusu I-Tsing, Nan-hai-Kuei-chi-nai-ch'uan fa into English under the title A Record of the Budhist Religion as Practised in India and the Malay Archipelago. However, in the book there is no name of Srivijaya, which exist only Shih-li-fo-shih. From the translation of inscription containing the name of Limestone City Srivijaya and the work of I-Tsing containing the name of Shih-li-fo-shih, Coedes later determined that, is the name of a kingdom of Sriwijaya in South Sumatra. Furthermore, Coedes also provides that, where the capital of Sriwijaya was Palembang, relied on the assumption Groeneveldt in his essay, Notes on the Malay Archipelago and Malacca, Compiled from Chinese Source, which states that, San-fo-ts'I is Palembang. 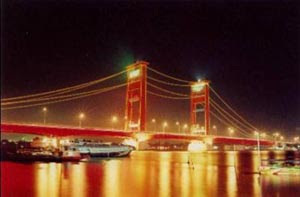 Other sources, namely Beal in 1886 expressed the opinion that, Shih-li-fo-shih is a region which lies on the banks of the Musi River, near the city of Palembang. From this opinion, then emerged a tendency among historians to regard as the center of Sriwijaya Palembang. Other sources that support the existence of Palembang as the center of the kingdom is the Telaga Batu inscription. This inscription is shaped stone slabs near pentagon, topped with seven heads cobra, with a form of a small bowl with spout (small mouth place out water) underneath. According to archaeologists, the inscription was used for the implementation of the ceremonial oath of loyalty and obedience of the official candidates. In the procession, the official who was sworn in drinking water that flowed into the rock and out through the spout. As a means for persumpahan ceremony, the inscriptions were usually placed in the center of the kingdom. Because it was found in the vicinity of Palembang in 1918 AD, it is strongly suspected of Sriwijaya Palembang was the center. Another clue is that Palembang was the center of the kingdom were also obtained from the findings of ceramics and pottery at the site Gutters Kikim, Cape Rawa, Bukit Siguntang and Kambang Unglen, all in the region of Palembang. Ceramics and pottery are the tools used in everyday life. These findings suggest that, in the past, in Kilkenny there is an ancient settlement. This assumption is strengthened by the results of interpretation of aerial photographs in the area west of Palembang city, which describes the forms of ponds and canals. Ponds and canals that were likely to regularly shaped man-made, not the result of natural processes. 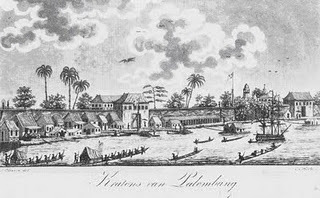 From the findings of ceramic and canals, then the archaeologists alleged that Palembang was the center of the powerful kingdom. As the center of the kingdom, the condition when it is mendesa Palembang (rural), unlike other royal centers are found in mainland Southeast Asia region, such as in Thailand, Cambodia, and Myanmar. The main ingredient used to make buildings in downtown Sriwijaya wood or bamboo that is easy to get around it. Therefore it is easily damaged materials consumed time, then there is no remaining buildings that can be found again. If anything, the rest of the settlement with the construction of the timber can only be found in swamps or river banks are submerged in water, not in downtown, like on the site Ujung Plancu, Batanghari regency, Jambi. There is a building made of brick or stone, but just building sacred (religious), as found in Palembang, on the site Gedingsuro, Angsoka Temple, and Mount Siguntang, made of brick. Unfortunately, the remaining buildings that are found only the foundation course. Along with the development, more and more data is found regarding the history of Srivijaya. In addition to the City Kapur inscription, also found inscriptions Coral lust (discovered in 1904 AD), Telaga Batu (found in 1918 AD), Kedukan Hill (found in 1920 AD) Talang Tuo (discovered in 1920 AD) and the New Boom. Among the inscriptions above the inscription Lime City is the oldest, bertarikh 682 AD, tells the story of the sacred journey of Minana Dapunta Hyang by boat, along with two laksa (20,000) troops and 200 crates of supplies, as well as the 1213 soldiers on foot. This trip ends at mukha-p. In these places, then set up Wanua Dapunta Hyang (township) called Srivijaya. In the inscription Talang Tuo who bertarikh 684 AD, is mentioned about the construction of the park by Dapunta Hyang Sri Jayanasa for all beings, named Sriksetra. In the park, there are trees whose fruits can be eaten. In another source, namely the Arab records, called Srivijaya Sribuza. Mas'udi, a historian of classical Arabic written record of Srivijaya in the year 955 AD In that note, depicted is a kingdom of Srivijaya, with a large army. Sriwijaya crops are camphor, aloes wood, clove, sandalwood, nutmeg, cardamom, gambier and some other crops. Of foreign records, we know that the kingdom of Srivijaya is great in its time, with the region and extensive trade relations to Madagascar. A number of other evidence in the form of statues, stupika, as well as other inscriptions further asserts that, in his time the kingdom of Srivijaya is having good communication with merchants and priests in China, India and Arabia. This just might be done by a great empire, influential, and calculated in the region. In the 11th century AD, Srivijaya began to decline. In the year 1006 AD, Srivijaya was attacked by Dharmawangsa of East Java. This attack was repelled, even Sriwijaya able to counterattack and succeeded in destroying the kingdom Dharmawangsa. In the year 1025 AD, Srivijaya had attacks that crippled the kingdom Cola, India. However, such attacks have not been able to eliminate Sriwijaya from the earth. Until the beginning of the 13th century AD, Srivijaya was still standing, though the power and influence has been very much reduced. Dapunta Hyang Sri Yayanaga (Inscription Kedukan Hill 683, Talang Tuo, 684). 1. Cri Indrawarman (Chinese news, the year 724). 2. Rudrawikrama (China news, 728, 742). 3. Vishnu (Ligor inscription, 775). 4. Maharaja (Arab news, the year 851). 5. Balaputradewa (Nalanda inscription, 860). 6. Cri Udayadityawarman (China news, 960). 7. Cri Udayaditya (Chinese news, the year 962). 8. Cri Cudamaniwarmadewa (Chinese news, the year 1003, the inscription of Leiden, 1044). 9. Maraviyayatunggawarman (inscription Leiden, 1044). 10. Cri Sanggaramawijayatunggawarman (Chola inscriptions, 1044). Sriwijaya kingdom ruling from the 7th century until the beginning of the 13th century AD, and reached the golden age in the era of government Balaputra Gods (833-856 AD). The decline of the kingdom is concerned with entry and growth of Islam in Sumatra, and the appearance of strength Singosari and Majapahit in Java. 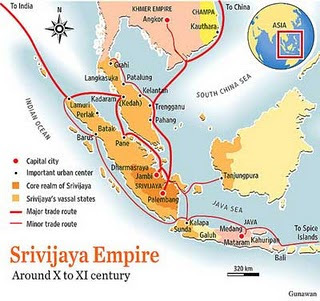 Historically, the kingdom of Srivijaya controlled the western part of the archipelago. One of the factors that could cause the Srivijaya controlled the whole western part of the archipelago is the collapse of the kingdom of Fu-nan in Indochina. Previously, Fu-nan is the only one in control in the territorial waters of the Strait of Malacca. Another factor is that Srivijaya naval forces are able to master traffic trade between India and China. 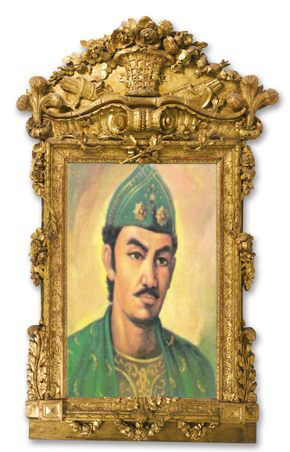 With a large fleet strength, Srivijaya and then expand the territory to the island of Java. 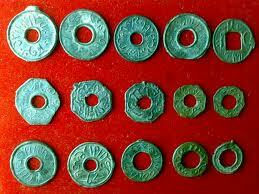 In another source said that, Srivijaya power to Brunei on the island of Borneo. From the inscriptions found Lime City JK Van der Meulen on Bangka Island in December 1892 AD, obtained clues about the kingdom of Srivijaya that Java is trying to conquer Earth. Although not explained where the region is the Bhumi Java in the inscription, some archaeologists believe, is that Java is the Kingdom of Bhumi Tarumanegara on the North Coast of West Java. Apart from the contents of the inscriptions, the Srivijaya power also can be known from inscriptions locations spread Sriwjaya these relics. In Lampung found inscriptions Pasemah Palas, in Edinburgh there is the Coral lust, in the Pacific there is the City of lime, in Riau have Barelang. All this suggests that, in these areas once controlled by Srivijaya. Other sources are saying that, Srivijaya power actually reaches the Philippines. It is evident that, Srivijaya had controlled most of the archipelago. 1. Samraj, that is sovereign over his subjects. 2. Indratvam, meaning to rule as god Indra who is always giving prosperity to its people. 3. Ekachattra. Eka means one and chattra means umbrella. This word means capable umbrella (to protect) all of his people. Equation showing the king with the god Indra the king of the Sriwijaya has a transcendent power. Not yet known exactly how the structure of government under the king. One aide called the clearly only senapati who served as a warlord. As a huge empire embracing Buddhism, Srivijaya has evolved in a climate that is conducive to developing the Buddhist religion. In traveling I-Tsing notes mentioned that, at that time, there are a thousand priests in Sriwijaya. In his first trip, I-Tsing had resided for six months in Sriwijaya to explore the Sanskrit language. I-Tsing also recommend, if a Chinese pastor wanted to learn to India, you should learn first year or two in the Fo-shih (Palembang), and then studied in India. After coming back from Nalanda, I-Tsing Sriwijaya settled in for seven years (688-695 AD) and produced two major works of the T'ang Ta-yu-ku-fa-kao-seng-chuan and Nan-hai-chi-Kuei -nei-chuan-fa (A Record of the Budhist Religion as Practised in India and the Malay Archipelago), which was completed in the year 692 AD This suggests that, Srivijaya was one of the important Buddhist religious center at the time. The first inscription mentions about King Balaputradewa of Suwarnadwipa (Sriwijaya) who built a monastery, while the second inscription mentions about King Kataha and Srivijaya, Marawijayayottunggawarman who gave gifts to a village dedicated to the Buddha residing in the monastery Cudamaniwarna, Nagipattana, India. In the field of trade, the kingdom of Srivijaya has a very good trade relations with merchants from China, India, Arabia and Madagascar. It can be ascertained from the findings of China's currency, ranging from the period of the Song Dynasty (960-1279 AD) to Ming Dynasty (14-17 centuries AD). In connection with the commodity being traded, the Arab news from Ibn al-Fakih (902 AD), Abu Zayd (916 M) and Mas'udi (955 AD) mentions some of them, namely clove, nutmeg, cardamom, pepper, areca nut, wood aloes , sandalwood, camphor, ivory, tin, gold, silver, ebony, Sapan wood, spices, and sea turtles. These items were bought by foreign merchants, or bartered with porcelain, cotton and silk fabrics. 2. D.G.E. Hall, History of Southeast Asia. New York: National Business.